The three primary minerals of granite shown here are mica (bright colors), feldspar (grey with parallel lines) and quartz (irregular grey at bottom).Pictured below are some of the rocks you might see on a hike in the Anza-Borrego Desert State Park. But these rocks have been cut into extremely thin sections not more than 10 microns thick and are viewed under the microscope. 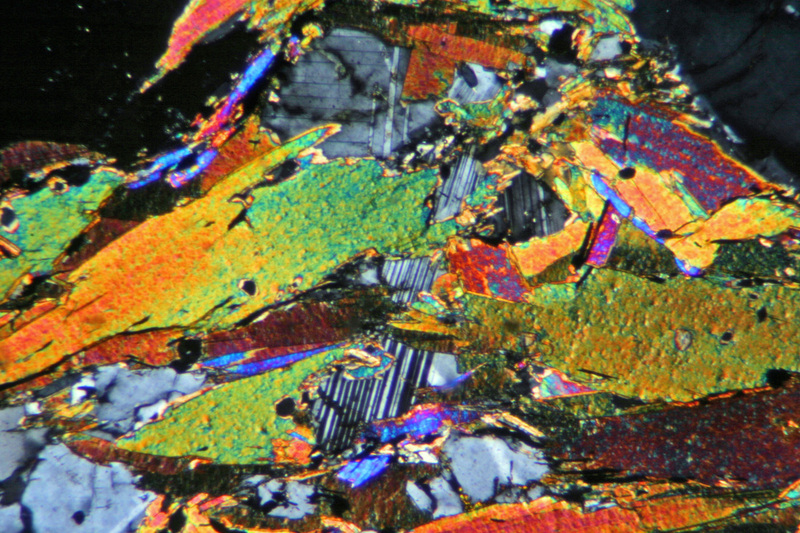 In many areas of geological study such as mineralogy, petrography, sedimentology and so on, thin section preparation is needed in order for samples to be examined microscopically for analysis of the characteristics of the soil or rock. This analysis is normally carried out using transmitted polarised light which creates a need for thin sections of known and exact thickness. 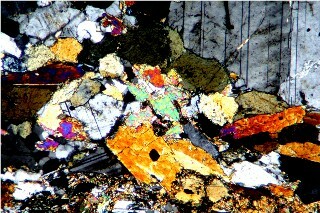 Biotite mica is one of the most colorful minerals in thin section. 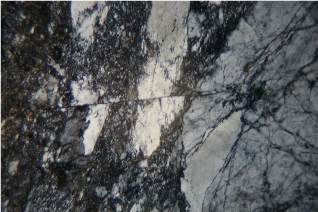 The three primary minerals of granite shown here are mica (bright colors), feldspar (grey with parallel lines) and quartz (irregular grey at bottom).